This article is about the Led Zeppelin compilation album. For the Dance Gavin Dance album, see Mothership (Dance Gavin Dance album). Mothership is a greatest hits compilation album by English rock group Led Zeppelin, released by Atlantic Records and Rhino Entertainment on 12 November 2007 in the United Kingdom, and 13 November 2007 in the United States. It was released on the same day that Led Zeppelin's entire catalogue became available in digital stores, including the iTunes Store. The cover (designed by artist Shepard Fairey) is a graphical interpretation of the Beresford Hotel, Glasgow, Scotland. The songs included were chosen by the surviving members of Led Zeppelin, Robert Plant, Jimmy Page and John Paul Jones, and represent the first eight of the band's nine studio albums. In addition to a two-disc set, the album is also available in both "deluxe" and "collector's" editions with a DVD featuring varied live content from the previously released Led Zeppelin DVD (2003). A 4-LP vinyl package was also released on 26 August 2008. On 6 November 2015, the album was reissued using the audio from the band's 2014–15 remaster campaign. On 8 November 2007, a temporary XM Satellite Radio station, XM LED was made to promote the album. ^ Cohen, Johnathan (2007-10-23). "iTunes Welcomes Zeppelin With Catalogue Box". Billboard. Retrieved 2007-11-19. ^ "Led Zeppelin - Mothership [Vinyl] - Amazon.com Music". amazon.com. "UK Music Charts – The Official UK Top 75 Albums: Week of Mon 19 Nov". UK Albums Chart. Archived from the original on 2011-05-15. Retrieved 2007-11-19. ^ Jonathan Cohen, "Keys Storms Chart With Mega-Selling 'As I Am'", Billboard.com, 21 November 2007. ^ "Top 100 Albums - 11 November 2007". infodisc.fr. Archived from the original on 2012-06-22. Retrieved 2009-01-19. ^ "Top 100 Albums - 11 November 2007". Oricon. Retrieved 2009-01-19. ^ "Top 100 Albums - 15 November 2007". swedishcharts.com. Retrieved 2009-01-19. ^ "Top 100 Albums - 18 November 2007". spanishcharts.com. Archived from the original on 24 February 2012. Retrieved 2009-01-19. ^ "Top 100 Albums - 19 November 2007". RIANZ. Archived from the original on 8 February 2008. Retrieved 2009-01-19. ^ "Top 100 Albums - 22 November 2007". FIMI. Archived from the original on 13 February 2012. Retrieved 2009-01-19. ^ "Top 100 Albums - 24 November 2007". chartstats.com. Archived from the original on 2013-01-19. Retrieved 2009-01-19. ^ "Top 50 Albums - 25 November 2007". IRMA. Retrieved 2009-01-19. ^ "Top 100 Albums - 25 November 2007". ARIA. Archived from the original on 14 December 2011. Retrieved 2009-01-19. ^ "Top 200 Albums - 1 December 2007". Billboard. Archived from the original on March 12, 2013. Retrieved 2009-01-19. ^ "Comprehensive Albums - 1 December 2007". Billboard. Archived from the original on September 29, 2007. Retrieved 2009-01-19. ^ "Top 100 Albums - 1 December 2007". ultratop.be. Retrieved 2009-01-19. ^ "Top 100 Albums - 2 December 2007". norwegiancharts.com. Archived from the original on 11 February 2008. Retrieved 2009-01-19. ^ "Top 100 Albums - 2 December 2007". portuguesecharts.com. Archived from the original on 14 February 2012. Retrieved 2009-01-19. ^ "Top 100 Albums - 9 December 2007". hitparade.ch. Archived from the original on 11 February 2009. Retrieved 2009-01-19. ^ "Top 100 Albums - 15 December 2007". dutchcharts.nl. Archived from the original on 5 April 2008. Retrieved 2009-01-19. ^ "Top 100 Albums - 16 December 2007". CRIA. Archived from the original on 15 January 2013. Retrieved 19 January 2009. ^ "Top 50 Albums - 16 December 2007". OLiS. Archived from the original on 2015-06-27. Retrieved 2009-01-19. ^ "Top 100 Albums - 21 December 2007". austriancharts.at. Archived from the original on 13 February 2008. Retrieved 2009-01-19. ^ "Top 100 Albums - 24 December 2007". musicline.de. Retrieved 2009-01-19. ^ "Top 100 Albums - 29 December 2007". Billboard. Archived from the original on 15 May 2015. Retrieved 2009-01-19. ^ "Top 100 Albums - 31 December 2007". finnishcharts.com. Archived from the original on 2 January 2008. Retrieved 2009-01-19. ^ "Top 100 Albums - 4 January 2008". danishcharts.com. Archived from the original on 19 December 2007. Retrieved 2009-01-19. ^ "Top 40 Albums - 12 January 2008". acharts.us. Retrieved 2009-01-19. ^ "Top 20 Albums – January 2008". CAPIF. Archived from the original on 2011-05-31. Retrieved 2009-01-19. ^ "Top 100 Albums - 15 March 2008". mexicancharts.com. Archived from the original on 24 July 2011. Retrieved 2009-01-19. ^ "Austrian album certifications – Led Zeppelin – Mothership" (in German). IFPI Austria. Enter Led Zeppelin in the field Interpret. Enter Mothership in the field Titel. Select album in the field Format. Click Suchen. ^ "Danish album certifications – Led Zeppelin – Mothership". IFPI Denmark. Scroll through the page-list below until year 2007 to obtain certification. ^ a b "Led Zeppelin" (in Finnish). Musiikkituottajat – IFPI Finland. ^ "French album certifications – Led Zeppelin – Mothership" (in French). Syndicat National de l'Édition Phonographique. ^ "Gold-/Platin-Datenbank (Led Zeppelin; 'Mothership')" (in German). Bundesverband Musikindustrie. 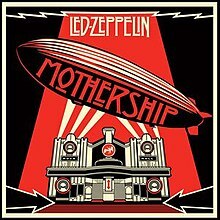 ^ "Italian album certifications – Led Zeppelin – Mothership" (in Italian). Federazione Industria Musicale Italiana. Select "Tutti gli anni" in the "Anno" drop-down menu. Select "Mothership" in the "Filtra" field. Select "Album e Compilation" under "Sezione". ^ "Polish album certifications – Led Zeppelin – Mothership" (in Polish). Polish Society of the Phonographic Industry. ^ "The Official Swiss Charts and Music Community: Awards (Led Zeppelin; 'Mothership')". IFPI Switzerland. Hung Medien. ^ "British album certifications – Led Zeppelin – Mothership". British Phonographic Industry. Select albums in the Format field. Select Platinum in the Certification field. Type Mothership in the "Search BPI Awards" field and then press Enter. ^ "American album certifications – Led Zeppelin – Mothership". Recording Industry Association of America. If necessary, click Advanced, then click Format, then select Album, then click SEARCH. ^ "Top 20 Reissues of 2007". rocklistmusic.co.uk. Retrieved 2009-01-19.